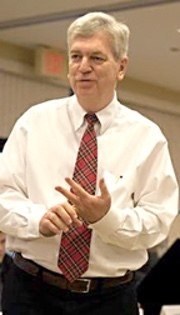 This newsletter was sent to all of the subscribers on Jim’s list (2,984) on Friday, Nov. 30, 2018. 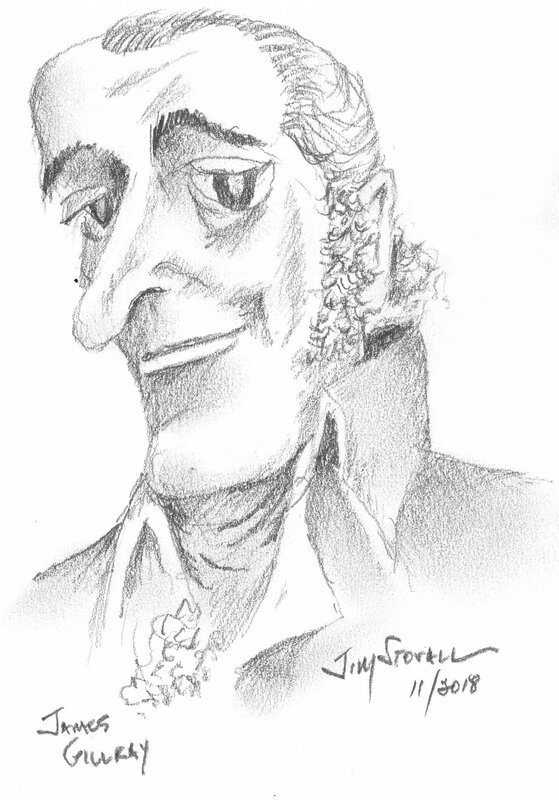 The theme of writing — good writing, I hope — permeates all of my newsletters, but this week you may notice another: caricature. I have tried this art form from time to time with varying degrees of success. This week I have tried to exercise my caricature muscles, both mental and physical, and have decided to foist the results on my poor newsletter readers. If these things tempt you to unsubscribe, please hold off for a bit. I’ll try to get better. Not great news from the apiary this week: We had four hives going into the fall, and now we’re down to two. Two of the hives died probably because the queens died. Why that happened is anyone’s guess. But this is not an unusual situation in the beekeeping world these days. Now the hope is that these two remaining hives — which appear strong at the moment — will survive the winter and create swarms this spring. Meanwhile, I hope that your week has been a good one — one of gratitude, honor, and kindness — and that your weekend is filled with joy. Under the newsletter’s hood: This newsletter was sent to 3,001 subscribers and had a 31.7 percent open rate; 12 people unsubscribed. Caricature is fairly common today (even amateurs like me try their hand at it), but in the late 18th century, it was a newly developing form of art, as well as social and political communication. 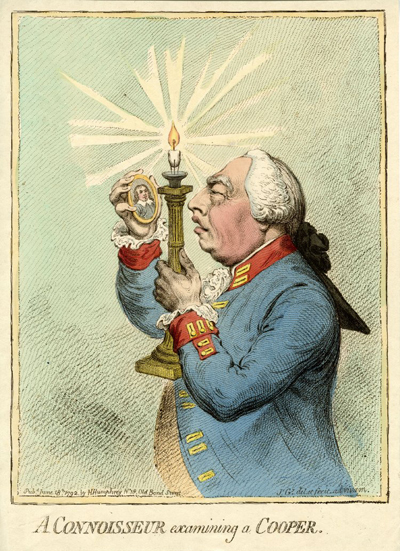 And no one was better at it — or set a higher standard for others of his time and those who came after him — than James Gillray. Gillray was born in 1756, and between 1775 and 1810 he produced an estimated 1,000 prints that were brimming with political and social satire, puncturing the pompous and leveling the haughty. He was highly popular with the general public and fiercely despised and feared in many political quarters. Public libraries deliver far more value to a community than the dollars they represent in a county or city’s budget, and smart local officials recognize that. So does the public. That’s why many communities have formed independent foundations and organizations to support their local libraries. A recent blog post on the Internation City/County Management Association website (Advancing Community Goals: The Evolving Role of the Public Library | icma.org) cites a national survey conducted by the Public Libraries Association and the Aspen Institute shows that more than half the jurisdictions that maintain libraries have such organizations. These groups have become integral to the financial stability of the libraries and help the library stay connected with the communities they serve. If your community library does not have such a group, consider getting together an informal “friends of the local library” group and starting something that will evolve into a permanent support organization. Bret Harte probably deserves a higher station than the one he occupies in the pantheon of American letters. A big part of the reason he doesn’t have it lies with his one-time friend, Mark Twain. Twain had known Harte from their days in the West when Harte achieved national fame in writing about the tall tales of the miners and mining towns they built. Stories such as “The Luck of Roaring Camp” (you can read it here at Project Gutenberg or hear it here at LibriVox) and “The Outcasts of Poker Flat” and poems like “Plain Language from Truthful Jones” entertained all of America and brought Harte a good deal of fame. Harte’s contributions to American literature are important because his writing represented a complete break with the stranglehold that English literature had on American writing through the first half of the 19th century. Harte not only wrote himself, but he encouraged other writers, particularly the young Samuel Clemons, aka Mark Twain, in their writing. Both writers eventually moved back to the Atlantic shore to continue their writing, and they even collaborated on a stage play, which turned out to be less than successful. Harte’s writing could not sustain its initial popularity, while Twain’s popularity grew exponentially. Eventually, their friendship dissipated with Twain delivering increasingly harsh judgments on Harte’s writing and his character. Exactly what precipitated the falling-out is not known, although scholars and friends have speculated about it. Twain wrote that Harte was “a liar, a thief, a swindler, a snob, a sot, a sponge, a coward, . . . he is brim full of treachery.” For his part, Harte never responded directly to Twain’s name-calling and bullying. After moving East, money problems caught up with Harte so that he accepted a consulate position at first in Germany and eventually became the U.S. Consulate in Glasgow, Scotland. He continued to write and amassed a long list of novels, short stories, and poems, but he never achieved the stature that he sought for his work. He died in 1902 in England after living for 24 years abroad and never returning to America. 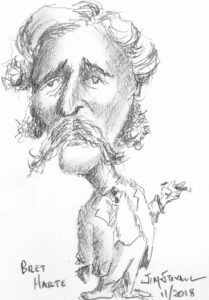 Four years after his death, Twain — by then an embittered old man — published his autobiography in which he continued his harsh criticism of Harte. It was a hatred that diminished Twain, but he could never let go of it. His column is How to Survive the Next Era of Tech (Slow Down and Be Mindful) – The New York Times, and it is well worth the time to read it. My good friend and faithful newsletter reader Dan C. sent me this link to a very cool site that has animated and annotated battle simulations for many famous European and American battles. On the American side there are Revolutionary War, Civil War, and World War II battles. If you are into this kind of thing, you’ll learn a lot: History Animated. Ann H.: Thank you for saying what I know a lot of people think about Facebook (last week’s newsletter). I have never signed up to it as I feel it is open to misuse and outright manipulation as well as a platform for trolls, bullies etc. If they don’t get into living in the real world it will be a rudderless cash generator for faceless people. I know it can do a lot of good but it needs regulation now before it is too late. Raging fires in California have killed dozens of people at this writing, and they’re still not under control. They have spread untold misery and disruption around the state. These people need our help.